Prosthetic dentistry - Poncz Dental fogászati rendelő és precíziós szájsebészet. The most important functions of the teeth are: aesthetics, crumbling of food and sound-formation. Due to the absence of teeth, the chewing capacity diminishes. As the crumbling is inappropriate, this may lead to gastro-intestinal illnesses. It can cause aesthetic problems as well, as an incomplete dentition can distort even the most beautiful smile. As a consequence of long term edentulousness, adjacent teeth may drift, the opposite teeth may protrude from the jaw bone and an overload may appear due to the inadequate distribution of chewing power. In our clinic we apply aesthetic prostheses made by the most state-of-the-art technology for the solution of missing teeth. If a tooth is discoloured, broken, worn or it has too many fillings, we recommend a crown. The crown unifies the structure of the tooth, hence providing long-term solution for these problems. In addition to metal prostheses made earlier, today, as a result of the development of dental materials, we prepare metal free prostheses as well. In case of the conventional metal-ceramic restoration, the frame is fabricated for the shape of the grinded tooth. Then this is supplied by a ceramic cover. In case of a metal-free restoration, the core is made of the white zirconium-oxide and it is covered by a porcelain crown. In our clinic, adapted to individual needs we prepare porcelain, pressed ceramic, metal-free zircone-ceramic and metal prostheses alike. It is a fixed restoration, that involves adjacent teeth. The bridge consists of the bridge itself which bridges over the gap and the supporting abutements. In case of a larger edentulous area we need to involve more teeth as abutements, thus the bridge restoration will be more stable, the distribution of the chewing power will be better, the load of the abutements will reduce. 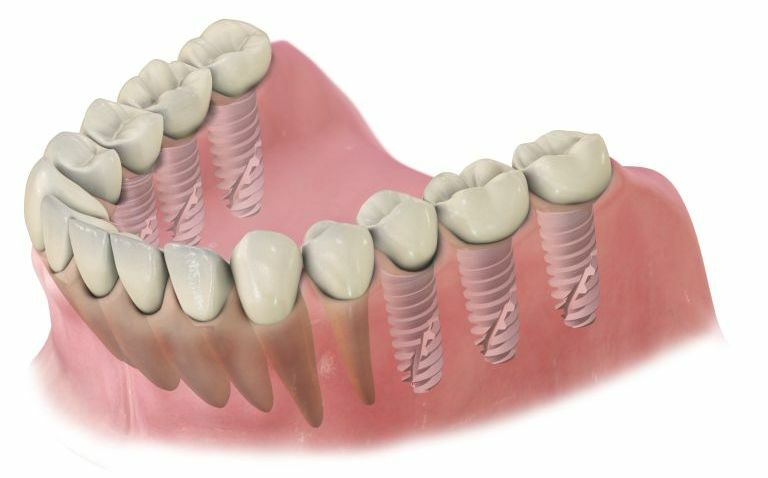 Dental implants mean a solution for the substitution of missing teeth. In contradiction to the bridge its advantage is, that it does not involve adjacent healthy teeth. 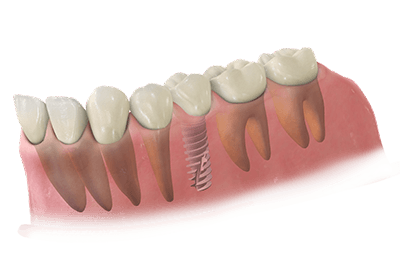 In this case an artificial root (the implant) is inserted into the bone, and will be covered with a restoration. Dental implantation can be carried out in case of one missing tooth or a completely edentulous jaw bone as well. In case of severe edentulousness, when the remaining teeth are not enough for a fixed prosthesis, we prepare a combined restoration. In this case claps or hidden anchorage tools stabilize the removable prosthesis to the fixed part or to the original teeth. It is comfortable and aesthetic, while it is easy to clean and hygienic. In case of complete edentulousness the chewing capacity and the sound formation can be restored, the damage of the jaw bone can be prevented with a removable denture. The parts of the removable prosthesis are the base plate, the artificial gum and the artificial teeth. The fabrication of the base plate and the artificial gum following the impression, play a crucial role in the stability of the restoration. The perfectly fitting prosthesis – thanks to the vacuum effect between the mucous membrane and the artificial gum – is stable without any denture-fixing cream. In time, with the change of the jaw bone, the denture might lose. In this case we restore its stability with inlay. Thanks to our modern technical background we prepare the removable restorations, prostheses with the maximum respect of the patients’ individual anatomic conditions. For the functional and aesthetic design we take into account individual demands and remarks.